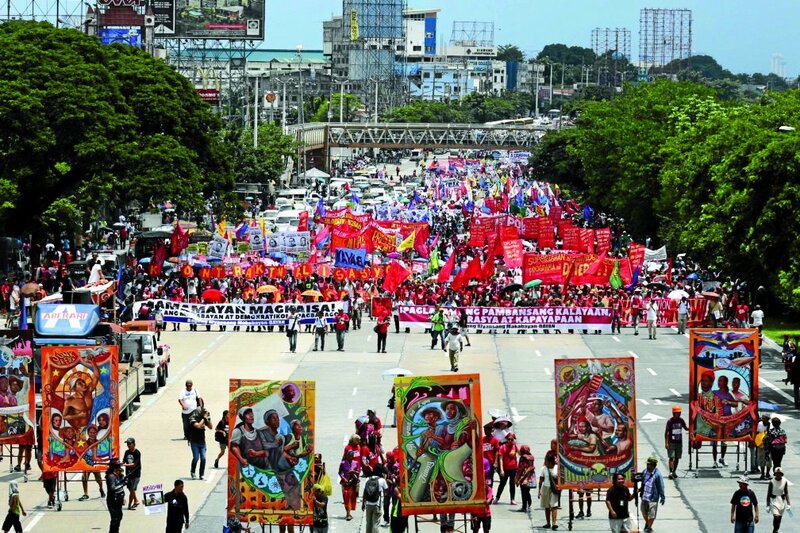 MANILA, Philippines - Described as one of the biggest and most peaceful rallies in recent history by a militant leader, the 2016 State of the Nation Address (SONA) rally attended by almost 30,000 protesters is indeed a historic one. Instead of burning effigy as the centrepiece of its Sona rally, the biggest nationwide militant organizations alliance Bagong Alyansang Makabayan (Bayan) paraded a six-panel mural to express their support to President Rodrigo Duterte. Standing 9-feet tall and 5.5-feet wide, the mural was made by artists from Sining Kadamay, Sining Bugkos, Ugat Lahi Artists Collective, Tambisan sa Sining and Kabataang Artista para sa Tunay na Kalayaan (Karatula). The six-piece mural called “Portraits of Peace” showed the 15-point agenda for change of Bayan earlier submitted to Department of Social Welfare and Development (DSWD) Secretary Judy Taguiwalo and Department of Agrarian Reform (DAR) Secretary Rafael Mariano. People’s governance, human rights, progressive social policy, sovereignty, national industrialization, as well as land reform and agricultural development are some of the themes showcased in this year’s Sona rally. In a press statement, Bayan said the mural aims to show the people’s aspirations for a better society. “Together they form the picture of the people’s hope for genuine change and a just and lasting peace,” Bayan said in a statement. For the first time in recent history, protesters were allowed to gather near the Batasang Pambansa where Duterte delivered his speech. Bayan secretary general Renato Reyes, who said the rally was a historic march, said Duterte has kept his promise to allow protesters get near the venue. “Ni-respeto niya ‘yung karapatan nating magpahayag. Tinototoo niya lang ‘yung napagusapan sa inauguration sa Malacañang na nag-paalam tayo na sana makalapit kami,” Reyes said.